While you might buy a different cup because of size, material, or appearance, you should buy the Ruby Cup because you want to make a difference. For each Ruby Cup that’s sold, a Ruby Cup is donated to a girl in Kenya. Menstruation is a major cause of missed school in Kenya because girls can’t afford menstrual products and are afraid of leaking in public. The cup itself is made of industry-standard medical-grade silicone and comes in clear, blue, and purple colors. It comes in two sizes: small and medium and you should choose between them primarily on the basis of how heavy your period flow is. It has all the benefits you would expect from a menstrual cup: long wear time, reduced waste, low cost. 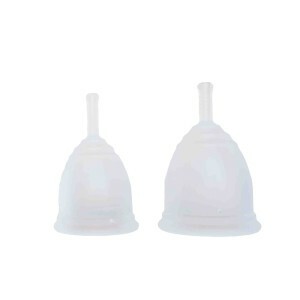 You can also buy a collapsible sterilizing cup, kegal exercisers, and other menstrual accessories from their website.